Since the beginning of 2010, the Kent State Truth Tribunal has been focused on collecting and understanding the truth about the circumstances that surrounded the killing of four students and the wounding of nine others at Kent State University in Ohio on May 4, 1970. As new evidence emerges that supports the belief that the Ohio National Guard was following orders to shoot when they fired into a crowd of peacefully assembled students, we are reminded that this tragic chapter in American history has left an indelible mark on the civic freedoms that define this country. One of the students shot was my sister Allison Krause and at the moment she died, Allison was protesting the invasion of Cambodia and the escalation of the Vietnam war at a noon peace rally on her college campus. Some of those shot were fellow protestors while others were students simply walking to class. Like many college students at that time, the protesters at Kent State were fighting the draft and opposed the war in Vietnam. At this peace rally on May 4th at Kent State, they were also protesting the Ohio National Guard’s occupation of their campus that had begun days earlier. 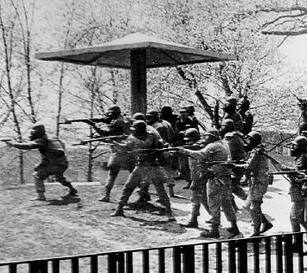 When the shots were fired, the U.S. government robbed the Kent State students of their right to exercise the First Amendment. It also sent a chilling message to young people across the country: If you protest against the government, you could be killed in the process. Until the truth about the Kent State shootings is known and laid bare before the public, the value and meaning of our First Amendment continues to be compromised. The words written and preserved in the Library of Congress have very little to do with citizen’s rights in America today. Fast-forwarding 40 years to May 4, 2010 and with the help of heartfelt Kent State supporters like Michael Moore, as well as many present at the original peace rally at Kent, the Kent State Truth Tribunal began to record and preserve the truth, broadcasting our findings at MichaelMoore.com. The buried truth about Kent State and the continued cover-up that surrounds the Kent State killings has begun to unfold before us. We now see how that the calculated acts of President Richard Nixon, Ohio Governor James Rhodes and the Ohio National Guard commanders seamlessly silenced and damaged the psyche of the sixties generation, robbing us of our civil rights. The consequences of their violent actions against students still reverberate today. I was 15 years old on May 4th 1970. Through the eyes of a teenager I felt the deeper personal angst and pain of losing my only sibling Allison as my family and our home was torn apart. Allison’s death and the harassment that followed will never be forgotten. When I lost Allison I was outraged but realized quickly that there was little that a 15-year-old could do. My parents, Arthur and Doris Krause, pursued redress through the courts, seeking justice the American way. In each and every litigation the shooting guardsmen, along with their commanding officers, claimed there wasn’t an order to shoot ~ that the guardsmen reacted with their shots because they felt their lives were in danger, despite the fact that many eye-witnessed remembered clearly hearing an order to fire. By taking this position and stating this under oath, the government forced everyone pursuing truth and justice in the Kent State killings to look for proof that an ‘order to shoot’ existed. Back to the present, just days after we closed the doors at the Kent State Truth Tribunal at the 40th anniversary of the killings in Kent, Ohio, important news was published by the Cleveland Plain Dealer. Read it here: bit.ly/aM7Ocm The Plain Dealer arranged an examination of an audio tape recorded by a Kent State student from his dorm window ledge. Two, expert forensic audio scientists, Stuart Allen and Tom Owen, independently confirmed an order was issued to the Ohio National Guard. 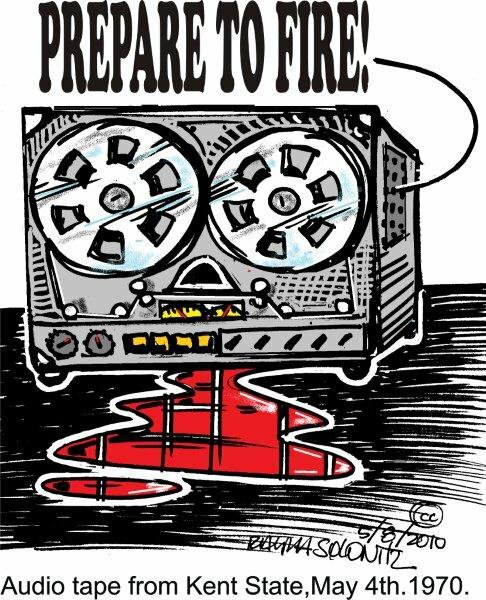 Mr. Allen found that the order “Prepare to fire,” can be heard on the audio cassette ‘as clear as a bell’. We have invited the federal government to send an official to audit and witness our interview with Mr. Allen. Additionally, we will be interviewing participants and witnesses of the Kent State shootings to hear and preserve their truth, as well as some notable guests with meaningful connection to the prelude and aftermath. Daniel Ellsberg will participate in our first Skype interview at this KSTT in New York City. You may remember that Mr. Ellsberg precipitated a national political controversy in 1971 when he released the Pentagon Papers, a top-secret Pentagon study of US government decision-making about the Vietnam War, to The New York Times and other newspapers. He will be giving us background into the political context and key elements of the Vietnam war at the time of the killings at Kent State. Mr. Lawrence Dowler, founder of the Kent State collection in the Yale Library where he was chief archivist (now retired), will share his truth on the collection he personally assembled, a collection revered to be the most extensive and accurate archive of the Kent State shootings. 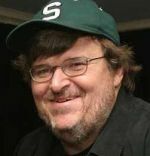 You are invited to share in this important moment in history by watching our live broadcast at www.MichaelMoore.com on Saturday and Sunday, October 9 and 10, from 10AM to 5PM est. You hope you’ll join us as we continue to uncover the truth at Kent State.